Pope Francis has set up a five-person committee to find ways to implement recommendations for streamlining and modernising the Vatican's many communications structures, reports the Catholic News Service. The reform effort is looking at how Vatican communications outlets can adapt to changing media consumption trends, better coordinate its existing channels, and make substantial financial savings. Msgr Dario Vigano, 52, director of the Vatican Television Centre, and now president of the new Commission for the Vatican's Communications Media. 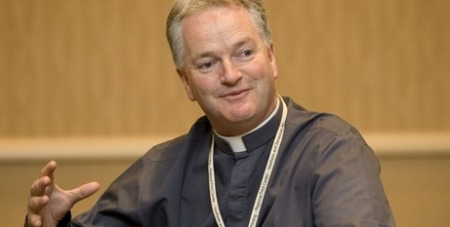 Msgr Paul Tighe, 57, secretary of the Pontifical Council for Social Communications (pictured). Italian Jesuit Father Antonio Spadaro, 48, director of the influential Jesuit journal, La Civilta Cattolica. Argentine Msgr Lucio Adrian Ruiz, born 1965, serves as head of the Vatican Internet Service and the Vatican's telecommunications office. Paolo Nusiner, the only layperson on the commission, was born in 1963 and is managing director of Avvenire, the daily newspaper of the Italian bishops' conference.